If you’ve ever searched for an inflatable hot tub online (like on our site) or on a local shop, you’ve probably encountered the brand Intex. They are among the largest names in the inflatable hot tub spa space in the world and have dozens of products. 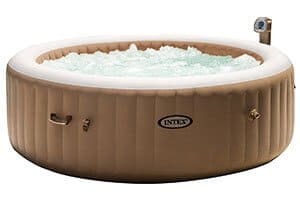 In this article, we dig into Intex Hot Tubs and review some of their hot tub sets and find out why they are one of the most recognizable names in their industry. One of the largest inflatable hot tubs in the market. It can seat up to 6 or 7 people while offering the same soothing hot bubble jets Intex is known for. While this hefty Intex portable spa set is priced a bit higher than some of its competitors. It’s worth every dime if you’re a spa-loving family. This model is made up of high-strength polyester fibers that are known to be durable and does not stretch over time. Offers plenty of safety features. One of the issues many customers face with inflatable hot tubs is their strength or durability. However, the PureSpa portable is no ordinary massage spa set I tell ya - it’s made of high-strength fibers that give it a durable build. Four people can enjoy a nice dip into its warm water that has a temperature range of 68 to 104 degrees Fahrenheit. It’s also every bit convenient and is very portable - you can set it up almost anywhere! It has a simple control panel that regulates everything from its heater down to its 120 bubble massage jets air blower. The machine also has several convenient features such as suspended crystals technology and hard water treatment system that makes the hot water gentler on the skin. This portable sparkle spa from Intex is large enough to comfortably fit in up to six people (except when that uncle is visiting, then you can only fit four). The unit comes with 170 high-powered fizz jets for a soothing, refreshing, watery massage. It’s easy to set up and has a very consistent temperature range that drops only a few degrees if you aren’t using the bubble jets. The machine’s maintenance is also pretty straightforward especially with its 10-watt HardWater System which uses four replaceable filter cartridges that effectively cleans the spa water. You can also adjust the water temperature via an easy-to-control panel. Lastly, the package comes with LED lights perfect for a night (skinny) dip and two inflatable pillows for a more relaxing time at the tub. The unit is made up of high-strength polyester fibers that are known to be durable and does not stretch over time. It also has a ton of safety features such as an insulated cover and lock. 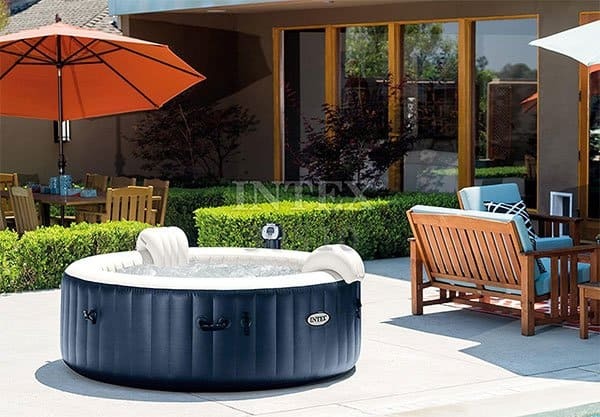 One of the largest inflatable hot tubs in Intex’s arsenal is the 85-inch Pure Spa Portable. This unit can fit up to six to seven people and has the same soothing bubble jets massage feature. It’s a great addition to your home to ramp up its luxury, especially if you have extra space in your backyard. Much of the inflatable hot tub is insulated such as its ground cloth and cover which improves heat retention. Like other Intex hot tub products, this one also has a hard water system which softens the hot water. This makes the water more refreshing and gentle to your skin. Lastly, it also includes a floating chemical dispenser together with a replaceable spa filter cartridge that keeps water quality maintenance much simpler. If you are the type of person who enjoys the company of others while on the tub, then you will surely have to consider the Intex 85in PureSpa Portable Bubble Massage Spa Set. This inflatable hot tub can accommodate six people (except for when uncle Phil’s visiting, then we can only fit like 4) while looking every bit as luxurious. 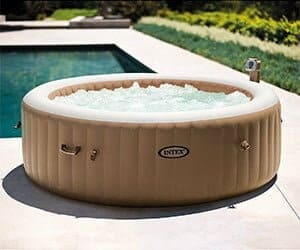 This portable hot tub from Intex is quite huge and has a diameter of 85-inches. Even at its maximum capacity, all six people sitting in the tub can fully extend their legs without touching those opposite them. Fun for the whole family... or the entire gang. The tub can hold up to 290 gallons of water with an approximate depth of 28-inches, which is enough to cover your body from shoulders below when they are on a regular seating position. While this inflatable hot tub requires a large space on your residence or property, the fact that it’s portable makes up for it. 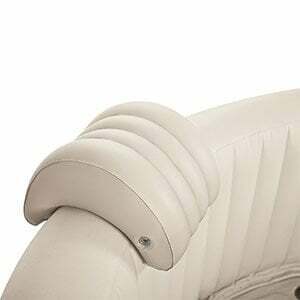 The unit can also be inflated with a touch of a button and can be dragged around thanks to its built-in handle. When you don’t want to use it over a period you can easily deflate it and store in a locker. Like many of Intex’s hot tub sets sets, this product is made of three-ply, high-strength polyester fibers. This material is tougher than the conventional ones like vinyl which are used by other manufacturers. Intex’s Fiber-Tech Construction is also superior to the common inner-beat construction, as the latter doesn't stretch over time. 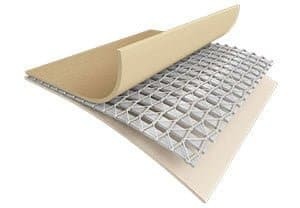 As such, you can expect this product to have superior structural stability without having to sacrifice the comfortable surface of its interior. You can definitely enjoy a refreshing spa experience without having to worry too much about the tub giving way. The unit also includes a durable insulated cover which can be locked and adds a layer of safety for your children, especially if they often wander around the hot tub without your permission. The Intex 85in PureSpa Portable Bubble Jets Massage Spa Set also produces a soothing bubble massage through its 140 bubble jet portals located all throughout the interior of the tub. This feature makes it perfect to soak in the spa set, after a tiring day’s work - it will remove most of your aches and pains away. While using the bubble jets massage feature, the temperature in the tub only drops a few notches. All thanks to its hardworking 1,300-Watt heater that warms the water at 1° F per hour. 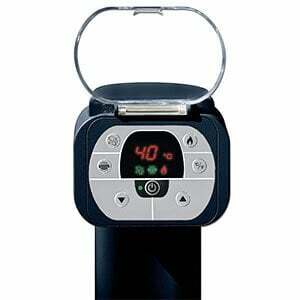 This allows you to still enjoy your preferred temperature all throughout your spa session. Key to its satisfying bubble massage experience is the quality of its water. The tub comes with its own hard water treatment system which makes the water gentler both for your skin and clothes. It also has a system that creates suspended crystals from calcium and other minerals. Moreover, the spa set also comes with its own control panel where you can manage every aspect of the tub. 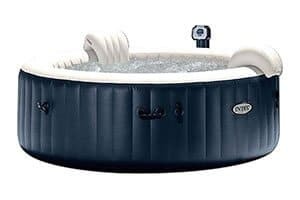 The Intex inflatable hot tub is also easy to set up and requires only a handful of steps for it to be totally functional once it’s out of the box. The package comes with its own inflation hose and the unit can fully inflate in just a few minutes. Completely filling it with water only takes less than an hour, while reaching its max temperature requires less than a day. Maintenance is also quite easy as the unit also comes with its own floating chlorine dispenser and uses replaceable spa filter cartridge. The package also includes test strips so you can begin testing water quality right away. The Intex 85in PureSpa Portable Bubble Massage Spa Set is definitely an attention grabber because of its size and design. However, its size can also be its drawback as not many homes really need that large of a hot tub. A larger tub also takes longer for its water to heat up because of its sheer volume so it requires more energy which translates to a few extra bucks in your electricity bill. If you have a small family and doesn’t often receive visitors who want to use the hot tub, you may want to settle with a smaller massage spa set to save money. However, if you have some extra cash to spend, then you’ll definitely have to get this product. This item is pretty much the basic package of the Intex PureSpa product line. The bubble rub-down set inflatable hot tub comes in a white and blue color scheme and can seat up to four people. It offers the best value in this list if you consider its features and its affordable price. But just a few simple features alone are enough for it to land in our Intex PureSpa review. The unit also comes with a built-in pump and heater which inflates it with just a touch of a button. It also has a bubble making features that creates a relaxing feeling while you are soaking in the tub. The unit relatively retains heat over a decent period. However, unlike the other models in this list, this product does not have the jet-propelled massage feature. Instead, it has a ring at the bottom which produces the bubbles. The Intex PureSpa Plus is designed to fit in almost everywhere- whether it’s outside or inside your home. The inflatable hot tub doesn’t consume much space and can fit up to four people in a comfortable seating position. It has a diameter of 77-inches and comes in a blue and white color scheme giving it a clean look. It may be smaller than some of its competitors in its space, but it’s quality build more than makes up for it. The tub is made up of high-strength polyester fibers and integrated with a three-ply Fiber-Tech Construction that maintains the tub’s integrity even after years of usage. The unit also comes with an insulated cover which can be locked to secure your inflatable hot tub when it’s not in use. This feature also adds another layer of safety for your kids and prevents them from going into the hot tub without adult supervision. The Intex PureSpa Plus requires only a few tools and extra materials for you to fully install it in your property. It comes equipped with an inflation hose which when pumped with air can inflate the tub in less than an hour. Additionally, the inflatable hot tub has a height of 28 inches and an inner diameter of 57 inches. This is enough to properly seat you with water levels just around your shoulder. With its water capacity at only 210 gallons, you can easily fill and drain out the water in under an hour which is great especially if you’re itching to try the product for the first time. Maintaining the quality of the water is also made easier thanks to its own chlorine dispenser. The product also includes several test strips so you can immediately adjust the water composition right after your first attempt to use it. Additionally, its filtration system uses inexpensive and replaceable filter cartridges that can save you a ton of money. I feel that an Intex PureSpa Plus Bubble Massage Set review isn’t complete without mentioning its best quality, which is heat retention. The Intext PureSpa retains heat fairly well. The inflatable hot tub has a water temperature range of 68 to 104 degrees Fahrenheit. Its heating unit is able to maintain your preferred temperature even if you activate its bubble function. Moreover, it warms up the water faster at 2 to 3 degrees Fahrenheit an hour. That’s about 50-percent faster heating speed as compared to larger massage sets. However, it’s important to note that the manufacturer doesn’t recommend you use it outside during winter months as it significantly loses its ability to heat the water. Because it can also retain its temperature levels pretty consistently, its electric consumption is not as high as its other rivals. It’s a feature that thrifty household owners would surely love. While it does not have the jetted massage spa you usually get from a more expensive hot tub system, its bubble massage does well also of relieving your stress. The combination of bubbles and softened water gives a relaxing touch that can help you unwind. Not to mention, the unit also has its own built-in LED lights that change the color of the water depending on your preference. Whether you’re up for a romantic dip or is the mood to party, this inflatable hot tub will conveniently set the tone for you. Another great thing about the Intex PureSpa Plus is the reliable control panel that can help you manage almost everything about the hot tub from its temperature to controlling its other functions. At just under $500, this inflatable hot tub offers great value for your money. It has everything you need in a relaxing massage set at about a fraction of the cost of some deluxe hot tubs. While it does not have the high-powered jet massage feature, its bubble massage is still a great way to help you get a relaxing dip. The tub is also easy to set up or disassemble, which is perfect if you have to tuck it away when not in use. Judging from the Intex PureSpa experience we had, we can pretty much say that the company produces some pretty darn good products. 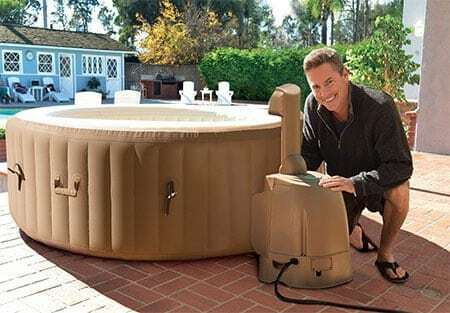 Overall, they are inexpensive and offer just the right features any homeowner would like in their inflatable hot tubs. The brand deserves the reputation it has gained over the years. I especially appreciate that they offer quality inflatable hot tubs that are portable and at the same time durable. 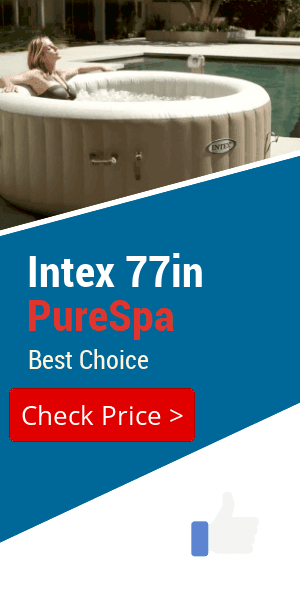 While there are several drawbacks in some of their products, this does not erase the fact that Intex is one of the go-to brand in the massage spa category. Disclaimer: All images on this page are the property of Intex. We do not own these images.